Great companies distinguish themselves from the competition by providing their customers with something truly special, something beyond price point that can’t be duplicated: unique, outstanding customer service experiences. “Win the Customer” cuts right to the chase, giving readers practical, powerful techniques for energizing the way they interact with the people who drive their business. When it comes to service, satisfaction is a short-sighted goal. Follow the simple rules in this book and transform ordinary customers into lifelong fans. A resource that will give everyone in your organization the tools necessary to earn the loyalty of your customers. Inspiring, pragmatic and a must-read for anyone who wants to make a difference in the lives of those they serve. 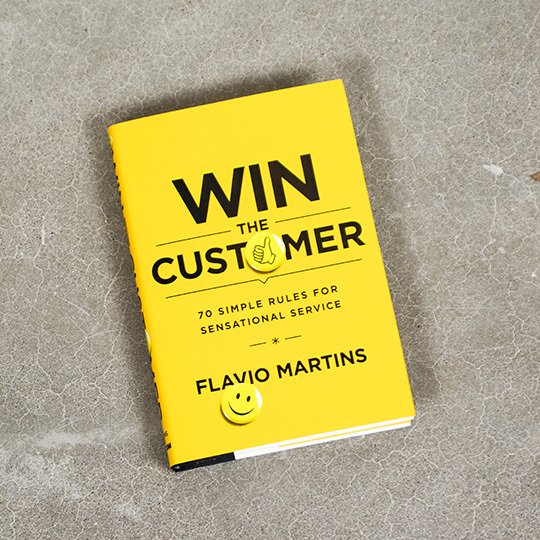 Flavio has set the standard for creating a customer-focused-culture that’ll dramatically effect your bottom-line. If you’re looking for new ways to effectively win over customers time and time again, look no further.